If you are a business owner, there is one basic thing that is essential for effective tax and business planning. Is it some crazy secret only us CPA’s know about? 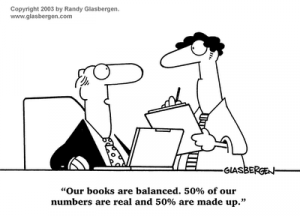 It’s good Accounting (or Bookkeeping, Recordkeeping, or whatever you want to call it)! Is it incredibly boring? To most business owners…Yes. Is it essential? Uh, yes it is. The foundation for all effective tax and business planning is to make sure the Accounting function is top notch in your business. Without good accounting, you literally cannot plan and make decisions in your business because the numbers you look at will not reflect reality. Let’s take an example with tax planning. This time of year we do A LOT of income tax projections and figure out ways to reduce taxes before year-end. The majority of taxes a business owner pays are a direct result of their business profits. Let’s say your accountant or bookkeeper misclassifies $100,000 of revenue or expenses (yes, this happens all the time). This can be a swing of $30,000-$40,000 of taxes. If we do tax planning based on these faulty numbers, the tax planning will be wrong. On the business side…we help a lot of businesses with cash flow planning, and the accounting has to be right for us to make decisions. Using the example above, if we think revenue is one amount, but it should be $100,000 higher or lower, our cash flow planning, and the strategic decisions we make about future investments will be off. So, as boring as accounting/bookkeeping is, it is the blocking and tackling of a business that has to be right…it is the solid foundation that will guide most future decisions, whether for tax planning or business planning. Many of our clients use our outsourced fixed fee accounting packages, not only because it’s less expensive than hiring someone, but because it gives them the peace of mind knowing that their accounting is right…and they can be confident in knowing they are making the right decisions for the future of their business.